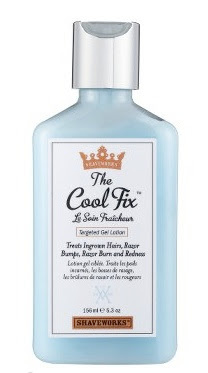 Shaveworks traditionally offers a variety of products for men; however, The Cool Fix, a special targeted gel lotion, is a unisex product that shaving parties of either gender can appreciate. The Cool Fix is designed to treat ingrown hairs, razor bumps, razor burn and redness that often results from close shaving. Application is easy, much like any other moisturizer, only The Cool Fix is comprised of ingredients that lend a unique soothing quality coupled with exfoliating agents to effectively prevent ingrown hair. Most surprising about this product is its lack of tiny beads typically found in exfoliating formulas. Instead, Shaveworks incorporates glycolic acid, salicylic acid, and phytic acid to lift dead skin cells, exfoliate and detoxify sensitive skin. Furthermore, an ingredient called, “mediacalm complex,” aka Boerhavia Root Extract, instantly soothes and reduces redness. The first stage to achieve maximum benefits from The Cool Fix is regular application for approximately one week. Following this initial phase, maintenance requires less frequent use. The only drawback is that despite its title, results do not necessarily create a cooling sensation. However, a burning sensation will definitely result when applied directly after shaving, and those who are not used to it should be prepared for a gasping effect at minimum. Those odd-sounding ingredients must be at work. Indeed, several days later users will see that The Cool Fix is a worthy investment for achieving a smooth, clean shave look.